The third Stakna Rinpoche Memorial Running Archery tournament saw the participation of 88 archers from 22 teams which was held on April 1 at Ranbirpur Ground. The tournament was organised by the Ranbirpur United Youth Cultural Welfare from last 3 years with an aim to promote archery in Ladakh and to raise funds for the renovation and restoration of the ruined ancient heritage sites of Ladakh. His Eminence Stakna Rinpoche, Jigmet Mingur Thinley Dorjey graced the occasion. P T Kunzang, Vice President, Ladakh Buddhist Association and the village heads of Ranbirpur, Stakna & Thiksay were present. His Eminence Stakna Rinpoche consecrated and inaugurated the office of the Ranbirpur United Youth Cultural Welfare Society and presented a token of appreciation in the form of ₹10,000 for numerous social and renovation work undertaken by the youths for almost one decade. P. T. Kunzang spoke about the contribution of the 13th Stakna Rinpoche Nawang Tonyot Jigdrel Dorjey in promoting religious harmony, brotherhood and his selfless contribution in building a harmonious society. He also appreciated the organisers for their social contribution and the renovation and restoration work carried out. 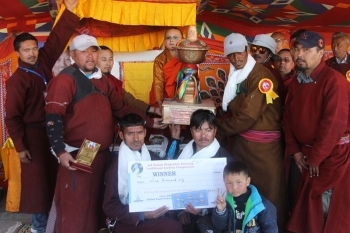 Shey Dartsal Tsogspa lifted the Running Archery Cup in Memory of H.E.Stakna Rinpoche, Nawang Tonyot Jigdrel Dorjey. Padma Stanzin, President, Ranbirpur United Youth Cultural Welfare Society presented a memento to His Eminence and P.T Kunzang for attending the tournament. Sonam Chosgyal Gyal, General Secretary informed that the team who will lift the winner cup for the three consecutive years will be awarded ₹50,000/- cash prize. The Ranbirpur United Youth Cultural Welfare Society was established in the year 2012 by the youths of Ranbirpur village. Following the path of H.E. the 13th Stakna Rinpoche Nawang Tonyot Jigdrel Dorjey who played a pioneering role in promoting religious harmony and preserving our age-old heritage sites, the youth promotes social harmony, brotherhood & preserve ruined heritage sites.